It’s been a while (apparently 7.5 years) since I’ve written something about home theater here. To be honest, not a lot has changed in my setup. I’ve moved from having satellite TV and watching (buying) lots of DVDs to primarily streaming content – Netflix or Amazon Prime. We still enjoy the occasional Blu-ray, but the quality of streaming is good enough and the convenience factor is high. I think there is also a social aspect to keeping up with what your friends are watching as well. There are many many options out there for seating. We’ve had two rows of couches from the start, but while couches are comfortable if you want to stretch out you either end up with some sort of foot stool – or you’re lying sideways. Honestly couches are a great solution, but they don’t have that fancy feel to them. Recliners are fancy. Many (all?) of the movie theaters today in our area have fairly nice recliners now. 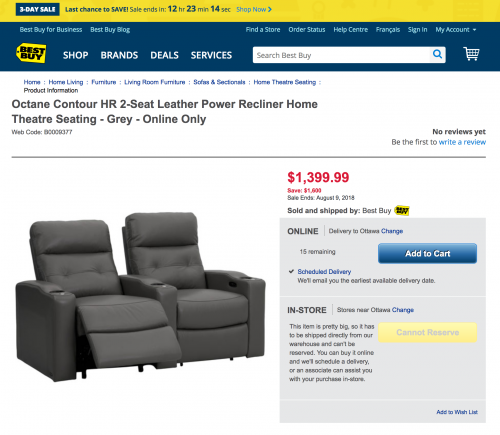 This got us looking at recliners. Ideally we’d go for Canadian made, but after searching around buying local drives the price up to double or more (and the quality). The couch we had in the front row was really showing it’s age and needed replacing. Specifications I was looking for: leather with power reclining, Jenn also wanted to make sure they looked ok because quite honestly many options are fairly ugly. With leather there is a lot of variation. You want to avoid any of the gel or bonded leather, these tend to be in the very low end of the market and simply won’t last or feel all that great long term. Sadly, leather appears to be completely unregulated and ‘top grain’ leather has a huge range as well. The other gotcha here is that the selection is nearly 100% online (at least in the price range we were looking at). BestBuy had a fairly good sale on, and they seemed to have real leather. When you go digging there are not very many reviews of these, and the result vary quite a bit. You can find Octane Seating – the company that makes these (in China). If you dig around, you find out that Octane allows for orders with custom fabric, and they have quite a range of grades they support as well. I think this explains why there is such a variety of reviews for products that are described similarly. I think we bought a day before the sale ended. While I was waiting for the delivery, I couldn’t help but check the website – and I wasn’t very surprised to see this. Ok, so the 3 day sale didn’t really end after 3 days, it was extended. Maybe they are trying to drain stock or something. Yeah, at this point it’s starting to get a little bit silly. It’s the sale that goes on forever. I was wrong, on the 17th it returned to normal full price. But… other models were now on sale. It seems there is always a sale for entertainment furniture, in fact – while I was writing the post they were back on sale for the same discount. We’ve had them a few weeks and have really enjoyed them. Going for the power recliner was absolutely the right choice, it was worth the price increase for that. The Octane Contour HR have motorized headrests which I would recommend, as a feature it seems like a gimmick, but it is really useful (and comfortable). The leather is not as nice as the love seat we bought a couple of years ago for basically twice the price. That said, the product that we received felt like it was worth the sale price. I wouldn’t pay the full price for these, or at least not what BestBuy is asking as full price. While these exact chairs may not be on sale, there seems to always be some of the models on sale. I’d also consider CostCo as another source. The motors are audible, but quiet enough that it’s not too intrusive if you adjust while watching. I’m basically 6′ tall, and I fit but I suspect a taller person may not be as comfortable. Oddities. The two seat pair, ships in 4 parts. Both back rests come off (and are easy for 2 people to put back on). You get 1 full chair (two arms) and 1 with a single arm. You simply place them together on the floor – and the weight keeps them in place. I expecting there to be some sort of locking / connection mechanism but no, it’s just placement. 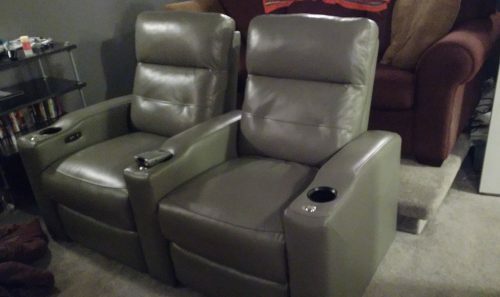 Overall very happy with the purchase, already thinking about converting the 2nd row of seating to recliners too. This entry was posted on Friday, September 14th, 2018 at 7:38 pm	and is filed under Home Theater, Reviews. You can follow any responses to this entry through the RSS 2.0 feed. You can leave a response, or trackback from your own site. A friend of mine alerted me to the fact that my reCaptcha was busted on the site, so I’ve done a bit of site maintenance and realised how terribly old some of the software here is. I’ll have to address that soon. He wanted to know if the individual recliner seats would support or block ‘intimate’ activity – something you can easily imagine might happen in a dark room. He also pointed out that it might be good (or bad) if you consider the teenagers watching a movie angle. Each seat is rated at 350lbs load bearing. So a pair of (slim) adults or teens might fit within the weight limits, however in the heat of the moment you will probably easily ignore the limits. The seats do recline quite flat, but not completely. I can’t help but think about the story of my friend and his (soon to be wife) managed it in a hammock, or at least that’s how the story goes. So the answer is yes, it’s certainly possible but tricky to do so as a pair of adults and stay within the weight limits. Teenagers probably need a strict talking to if you’re going to leave them in a dark room for too long by themselves.